TimeZone’s sales boards provide a venue for our members to buy, sell and trade among themselves. TimeZone is not involved in transactions, and all TZ sales board transactions are undertaken at your own risk – please be sure to review our Sales Board caveat emptor warnings and User Agreement. Here are a few tips to help you buy, sell and trade safely. Rule # 1: Know your seller or trading partner. It is very easy for scammers to create fictitious online identities and to provide false references. Accordingly, you should learn as much as possible about your seller or trading partner and take all possible steps to verify the information – do not accept information at face value. Ask yourself: if you send payment and receive nothing in return, do you have enough verified accurate information to locate the seller? Don’t be afraid to request and check information! TimeZone cannot locate sellers for you. – Check their TimeZone member information. 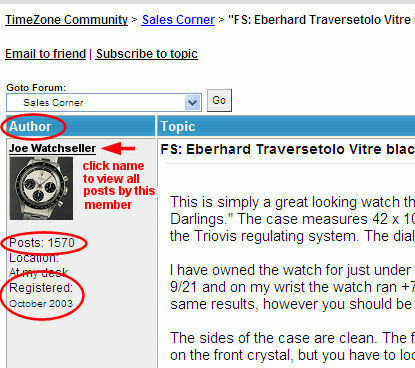 As shown in the image below, inside each open TimeZone post on the left hand side, you can see the poster’s alias or screen name (Joe Watchseller in the example below), when they registered for TimeZone, and how many posts they have made. You can click the poster’s screen name to view all of the posts they have made on TimeZone. Generally speaking, the longer someone has been a TimeZone member and the more posts they have, the more trustworthy they will be. This general rule does have occasional exceptions; we have seen fraud committed by users with over 200 posts. Click the screen name link to view the posting history. If someone has run up a large post count in a short time by making quick “nt” (no text) posts, that may be cause to investigate your seller or trading partner further. – Check the Watchnet Deal Watch and Good Guys boards. Make sure your trading partner is the person they ask you to look up. – Ask about your seller in the TimeZone Public Forum. You can make a post in the TimeZone Public Forum asking if anyone can provide feedback on a TimeZone seller. Be aware that a seller may have multiple TimeZone accounts under different names, so they may be able to post false positive feedback for themselves. If the responses to your reference request come from members with little TZ history (recent members or low post count), the feedback may be less reliable. – Get your seller’s home or office address (not a PO Box number) and at least one telephone number. A reputable seller should be willing to provide their contact information. To the extent possible, use your telephone and online resources such Google and telephone directories to verify the information provided – a scammer can give you a phony address and phone number, or someone else’s address and phone number. If you are corresponding with your seller via e-mail, tell them you would like to speak with them on the phone before concluding the transaction, and then follow through and call them. – Ask your trading partner to provide their online auction site user name, check the feedback on that person, and most importantly, send them an e-mail using the auction site’s “contact user” system to verify that the person you’re dealing with is in fact the user whose feedback you checked. Anyone can say "I have over 300 positive feedbacks on eBay" and point you to an eBay user name – make sure your seller really is the eBay user he referred you to. Know what you are buying or trading for. Do your research on the item you want to purchase. Learn things like where serial numbers are located and the strap size the watch takes (the distance between the lugs) and ask your seller to provide this information. Have clear images of genuine examples of the watch you seek, and if you have doubts about the authenticity of a watch being offered to you, compare your images with the one the seller provides. Note that sellers can easily copy images from the internet and send you images of a genuine watch they do not possess. A few thoughts about references. References are easily faked. A scammer might have a dozen free e-mail accounts set up under different names so that he can provide his own references, or the scammer may have friends or associates act as references. The most reliable references are people known to you personally. References from people who are unknown to you are of little value. Escrow services are often recommended as a means of avoiding fraud, however they do not provide complete protection. Escrow companies usually do not open boxes, so a scammer can ship a box with a rock in it. The escrow company will send your funds to the scammer, send you the seller’s box and rock, and they will have done their job. Even if the box is opened and checked, escrow companies do not recognize fakes or guarantee authenticity of items shipped, so a counterfeit watch will fool them. Finally, there are many phony escrow companies out there. Some have very convincing websites. Do your homework and beware of buyers or sellers who insist on an escrow company you are not familiar with. If you do use an escrow service, use only a reputable and well established company such as www.escrow.com. You should also be aware that many reputable sellers will not use an escrow service as it increases fees, delays completion of the transaction, and adds another step where something might get lost or go wrong. A seller’s refusal to use an escrow service is not necessarily an indication that the seller is dishonest. If the deal seems too good to be true, it probably is. This is the oldest advice in the book but it still holds true. Scammers often exploit greed. Be suspicious of sellers offering items at large discounts based on an immediate need to raise cash. Always be willing to walk away from a transaction if you are not comfortable. A desirable watch offered by a new TimeZone user with low post count. Be extra careful as the seller is not an established community member. Be wary of sellers using free e-mail addresses like Hotmail, G-mail, AOL, Yahoo, etc. These do not require a credit card to set up and are favorites of scammers. Refusal to provide contact information. If you request the seller’s street address and home/business telephone number and they will not provide it, this is not a good sign. Inability to provide additional images of the item offered for sale. If the seller won’t provide additional images, this may indicate that they do not have the watch. Also be wary if the seller’s images do not match up in terms of the background, lighting, watermarks, focus, or date/time stamp. This may indicate that the seller is using several unrelated images copied from various sources to create the impression that they have the watch. Requirement that payment be sent via Western Union or similar "instant cash transfer" systems. The Western Union web site states that you should only use their service to send money to people you know personally. Pressure to send funds or provide financial information quickly. For example, a seller may claim to have multiple offers and pressure you to act quickly by offering the watch to the first person to send funds or provide a credit card number. Be wary of these tactics. Genuine sellers want you to be happy with the transaction and will not pressure you to act hastily. Offers to purchase the item you are selling from overseas buyers that present unusual circumstances or requests. For example, the buyer might want to pay with a check that is greater than your selling price and request that you pay the extra proceeds to a third party. Convoluted payment methods are often a sign of fraud. Offers to purchase your item that include a request for you to provide the buyer with personal and financial information, such as your name, address, and bank account. Ask for more images of the item. Make sure your seller actually has the item they are selling or trading. If you have any doubts, ask them to send you an image of the item with a current newspaper or magazine. If the item is a watch, ask them to send you a picture of it set to a specific time that differs from the time shown in the posted images. Request a face to face transaction. If you’re not sure about a proposed deal, tell the seller you have a friend who lives near them and that you would like to conclude the transaction face to face through your friend. Most scammers will not accept such an offer. Use Google and online telephone directories to check information provided to you. If your seller provides you with a business name and/or phone number, run Google searches on them. If you get an address, use Google, Mapquest and other resources to verify that it’s an actual address. Telephone to make sure the address you send your money or watch to is what the other party claims. For example, if they say it is a residence, make sure it is not a actually a shipping center, mail drop, hotel, or other location where someone might receive a package anonymously. If your trading partner has provided a business name, check with their local Better Business Bureau. Overseas transactions present a greater level of risk than deals with sellers in your home country. Some areas such as Nigeria, Indonesia and some Eastern European nations have come to be associated with high levels of online fraud and some experienced online sellers refuse to deal with individuals in these areas. If you enter a transaction with someone overseas and there are problems, the courts and law enforcement officials in your home country or city/state may be little help. Some sellers refuse to deal with buyers who live outside their home country for this reason. Finally, international transactions can present tax or duty , shipping, and import/export issues. For example, some sellers will not ship Rolex watches into the USA due to restrictions on their import. Take all of these factors into account and do your homework before entering into an overseas transaction. Payment sent, no goods sent in return. This is the most common scam. A seller offers an item for sale. They may have the item, or they may use borrowed images to create the impression they have the item. They convince you to send money, but they never send you anything. Trader seeks to exchange their watch for yours. You ship your watch to the other party, they do not send you a watch, or they ship you a cheap fake watch or a box with a rock in it. Counterfeit watch sold as genuine, or genuine watch offered but counterfeit watch sent. The seller may possess a genuine watch and so be able to send you specially requested images. The buyer sends payment, and the seller ships a fake watch. This scam will fool most escrow companies because they do not inspect packages or guarantee the authenticity of the goods they handle. Counterfeit bank checks or money orders sent as payment. Buyer usually insists waiting for check to clear is not required since they are sending a bank, certified, or cashier’s check, or a money order. Seller agrees and ships the watch on the same day the check or money order is deposited. A few days later, seller’s bank informs seller that the check or money order was a fake. Today even U.S. Postal Service money orders are being counterfeited. Be careful! Third party checks: Be wary of buyers who seek to pay with third party checks, or with checks that are for more than your asking price. Convoluted payment methods are often a sign of a scam. Phishing and Identity Theft: The “for sale” or “for trade” posting is a ruse to get buyers to disclose personal information such as names, addresses, credit card numbers, or bank account information. The seller may pressure the buyer to provide information quickly to secure the item being offered. If you are a seller, a buyer may tell you they need your confidential financial data to transfer funds. Save a copy of the ad(s) you responded to. Save all e-mails to and from the seller. Save anything the seller sent you, such as a box and anything inside. These items may contain postmarks, fingerprints, or other evidence. Contact your local police and ask about filing a police report. Inquire about filing a report with the FBI. If the U.S. Postal Service was used in your transaction, contact the Postal Inspector. Report the incident on the Watchnet Deal Watch board. Get the word out and help prevent others from being taken.